Steaming is a healthy way to cook seafood over the coals while retaining all the flavour and juiciness. Crayfish isn't compulsory; any seafood will do the trick. 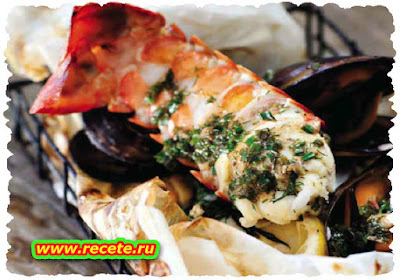 • To bake the parcels in an oven or a kettle braai, cut 4 squares of baking paper big enough to hold the seafood filling. Or wrap the parcels in foil if you want to cookthem over an open fire. You can experiment with different ingredients, as long as they all take roughly the same amount of time to cook. • Divide the ingredients between the squares. Put a few lemon wedges on top of each parcel and fold the sides tightly to keep the liquid in. • Cook the parcels over medium-hot coals or bake them in an oven at 180°C for 10-15 minutes. • Here's how to make the sauce: Add the wine, spring onions and garlic to a saucepan and simmer until the liquid has reduced by half. Cube the butter and add it to the wine sauce with the parsley. Remove the saucepan from the heat as soon as the butter has melted and stir until a thick sauce forms. • Unwrap the foil or baking paper and drizzle a tablespoon of sauce over each portion. Serve with a summery potato salad.